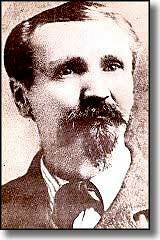 Alfred Packer was born on November 21, 1842 and raised in Allegheny County, Pennsylvania. At age 19, the Civil War broke out and he enlisted in the 16th US Infantry in Wynona, Minnesota. He was honorably discharged before New Year's due to epilepsy. In June, 1863, he tried enlisting again, this time in the 8th Regiment of the Iowa Cavalry. He was again quickly mustered out due to epilepsy. From that point on, it seems that he headed west and wandered around the mining camps for ten years doing miscellaneous jobs. In late 1873, Alferd Packer and a group of 20 other prospectors left Bingham Canyon, Utah and headed east, intent on going prospecting in the San Juan Mountains of Colorado. It was quite a winter that year as they only made it to Chief Ouray's camp at the mouth of Dry Creek, 2 miles south of Delta, in January, 1874. They arrived hungry and desperate. 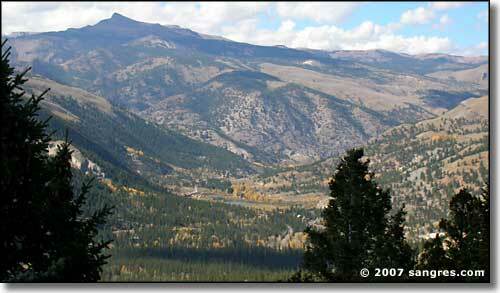 The Utes took good care of them but also urged very strongly that they not continue into the mountains until spring. The mountain passes were treacherous, the avalanche danger was high and, in places, there could be enough snowfall to simply bury the men. Five of the men had gold fever so bad they just couldn't wait. 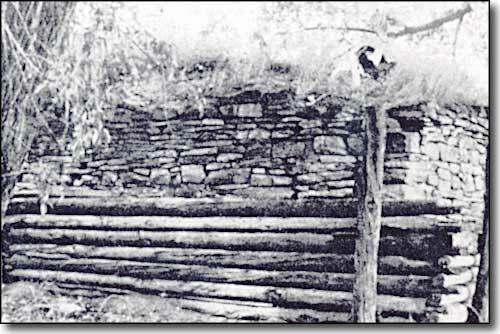 Their plan was to hire Alferd Packer as their guide and go to the Los Piños Indian Agency on Cochetopa Creek between Saguache and Gunnison. Packer claimed he eventually staggered another 50 miles to the Los Piños Indian Agency, arriving there on April 16, 1874, but he was looking pretty good for someone who said he'd been struggling through heavy snow for ten weeks. Later, several witnesses popped up who said they had seen him in Saguache a week or more earlier. He was telling people there that he'd hurt his leg and dropped behind his companions. He was asking everyone if they had seen them, did they make it out of the mountains alive? At the same time, these witnesses said that Packer had several wallets in his possession and there were rolls of money in each. 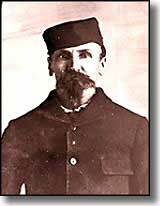 The photo to the right is Alfred Packer while he was an inmate in the Wyoming Territorial Penitentiary. About a month after he came out of the wilderness, Packer started to provide details as to what really happened to his companions. Finally, on May 8, he gave his confession and signed it under the supervision of General Charles Adams at Los Piños. This was the first of several versions that Packer would tell over the remainder of his life. 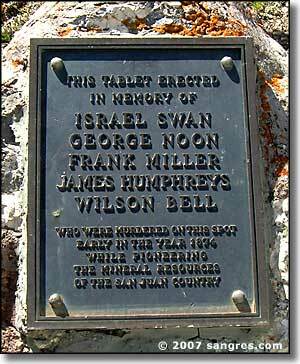 In this first version, Israel Swan died first, him being 65 years old and the trip extremely hard on him. This was about 10 days out of Ouray's camp and the survivors all ate pieces of him before moving on. 4 or 5 days later, James Humphrey died and was also eaten. Packer also admitted to lifting $133 from Humphrey as the dead man didn't need it any more. Frank Miller went next in some unspecified accident. Packer said he had been hunting firewood and came back to find the other two already eating Miller so he sat at the campfire and joined in. A few days later, Packer claims he was off hunting game when Bell killed Noon with Swan's gun. When Packer returned to camp, he and Bell finished eating Noon. Then, supposedly, Bell decided to finish Packer, too, and in the ensuing fight, Packer killed Bell instead. Once this confession was signed, Packer was forced to lead a search party into the mountains to try to locate the bodies. Packer, of course, led them to the wrong place and nothing was found. However, no one believed Packer's story anyway so he was arrested and jailed in Saguache pending further investigation. That August, a Harper's Weekly Magazine artist named John Randolph found five sets of human remains in a cluster just above the bank of the Lake Fork of the Gunnison, a couple miles upstream from what is now Lake City. It looked like one of them had put up a fight but the others had been killed in their sleep. Two of the bodies had pieces of flesh cut out of them, one from the breast, the other from the thigh. He sketched everything in detail and then went to town and reported his discovery. The Hinsdale County Coroner collected up 20 men as witnesses and they hurried over to the site for an inquest. Everybody took a good look at the bodies, then they buried the remains together on a bluff overlooking the site of the discovery. Then they hurried back to town to confront Packer with his lies but found he had been helped to escape from the Saguache jail (in a later version of the story, Packer claimed that the sheriff had felt sorry for him and let Packer go free). Packer hid out for nine years under the name John Schwartze but finally, in Fort Fetterman, Wyoming, a member of Packer's original party that had started out with him from Utah (a fellow named Frenchy Cabizon) recognized Packer's laugh in a saloon and turned him in. Packer was immediately arrested and transported back to Lake City for trial. A grand jury there returned five indictments against him for the hatchet-murders of his five companions. On March 16, 1883, with General Adams again supervising, Packer offered up a second confession. 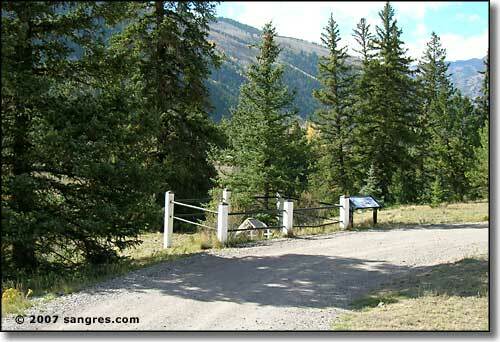 This time he said that the group had left Chief Ouray's camp with 7-days supply of food for one man. Ten days into the journey, he said they were surviving on rosebuds and pine pitch and some of the men were showing severe signs of depression and madness. One day Swan told Packer (their erstwhile guide) to go up on a mountain and scope out the trail. When Packer returned to camp, he said he found Bell sitting by the fire, roasting a chunk of meat from Miller's thigh. As Packer approached, he said Bell picked up the hatchet and came at him. In self-defense, Packer shot Bell sideways through the stomach and Bell went down hard. Then Packer grabbed the hatchet and whacked Bell hard on top of his head to finish him off. Packer claimed that every day after that, he tried to leave the gruesome camp but was stopped by the snow depth. So each day he ate a bit more of his companions, surviving this way for about two months. Finally, he packed up a gun, $70 he'd found on the bodies, several chunks of human flesh and headed out for Los Piños. While he doesn't account for several strips of human flesh that were found later along his trail he does say that he ate the last bits he had with him just before reaching the Agency. He also admitted that he had misled the 1874 search party (he claimed he didn't want to go anywhere near the grisly site and see what was left) and that he escaped from the Saguache jail by using a penknife as a key. He also claimed that he went first to Arkansas and then to Arizona before going to Wyoming where he was caught. 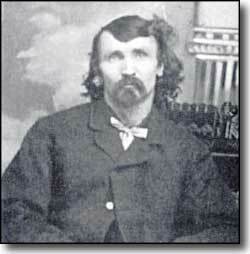 On April 6, 1883, Alferd Packer's trial began in Lake City at the Hinsdale County Courthouse. During the trial it came out that Packer said he'd had a struggle with Bell and had shot him in self-defense but it was Swan's remains that showed evidence of a hand-to-hand struggle and that was ample evidence of a more violent situtation than Packer had admitted to. When Packer took the stand in his own defense, he went on for more than two hours, telling quite a few new lies along the way. In particular: he lied about his age, the nature of his military service, the cause of his epilepsy and the fact that he'd been discharged from the Army twice because of his epilepsy. He denied killing anyone except Wilson Bell, and he said that killing was done purely in self-defense. He did admit to eating portions of Bell and Miller. On Friday the 13th of April, 1883, Packer was convicted of the premeditated murder of Israel Swan. One local newspaper quoted Judge Gerry as saying, "Stand up yah voracious man-eatin' sonofabitch and receive yir sintince. When yah came to Hinsdale County, there was siven dimmycrats. But you, yah et five of 'em, goddam yah. I sintince yah t' be hanged by th' neck ontil yer dead, dead, dead, as a warnin' ag'in reducin' th' Dimmycratic populayshun of this county. Packer, you Republican cannibal, I would sintince ya ta hell but the statutes forbid it." Judge Gerry was actually quite literate and his court-recorded comments were far different from the above, but you can get the sentiments of the time from the quote... Gerry did sentence Packer to be hanged on May 19, 1883, "until you are dead, dead, dead, and may God have mercy upon your soul." Using all the legal avenues he had available, Packer avoided hanging and two years later, won the right to a new trial, this time 30 miles away in Gunnison. The Colorado Supreme Court had overturned his murder conviction because he had committed the crimes while Colorado was a territory and the laws had changed when Colorado became a state (in 1876). In 1874 there had been no murder statute and, technically therefore, Packer had committed no crime. The trial in Gunnison went the same way as the one in Lake City except that this time, he was charged with five counts of voluntary manslaughter. He was convicted and sentenced to serve eight years on each count consecutively (40 years total). "Emergency cannibalism" had become so common in the West that the judge wanted to make an example of Packer. He was offered a job as a side-show freak with the Sells-Floto Circus but he took a guard job at the Denver Post instead. Shortly after that he moved to Deer Creek Canyon in Jefferson County and spent the rest of his life managing two mines and dealing with his stomach and liver ailments. Neighbors said he was a kind man and that he loved telling children stories of his exploits in the mountains. He died of a stroke on April 24, 1907 and, as he had been collecting a military disability pension of $25 per month since sometime during his imprisonment, he was buried at government expense, as befitting a veteran of the Civil War.